Focus is a new application available on the Mac App Store that makes it easy to add depth and lens blur to your photos. With support for many of Mac OS X’s unique features, Focus makes enhancing photos more intuitive than ever. To those who know a bit about photography, depth of field plays a big role in what separates good pictures from great pictures. But for those who aren’t pros with top notch equipment, it’s difficult to achieve that level of quality with a point and shoot or smartphone camera. Focus, now on the Mac App Store for $4.99, helps non-pros get the results they’re looking for with intuitive blurring effects. Since Mac users are generally a creative bunch, Focus will likely appeal to a lot of folks. It can breathe new life into photos, especially if they are already good to start with and just need that little something extra to reach the next level. And since Focus does just one thing and does it well, all of the complexity of other photo editing applications is nowhere to be found. To get started with Focus, just launch the app and drag a photo to the window. Next, select a tool preset – Portrait, Nature, Architecture, Macro, Tilt & Shift – and customize the area of focus along with the level of blur. It’s really simple to do, especially with a live preview of exactly what the finished product will look like. 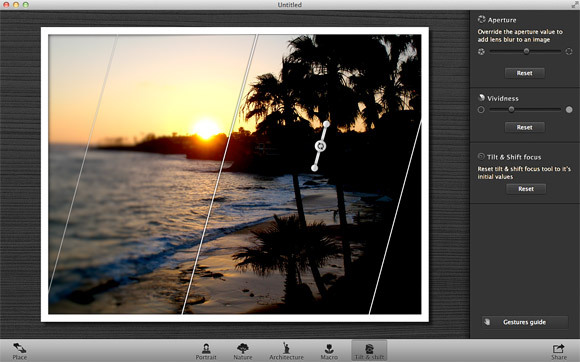 You can also crop, zoom, and make other adjustments to experiment with the photo’s composition. Focus takes full advantage of Lion features like Multi-Touch gestures, versions, full screen, and resume so it feels like a Mac application in the same family as iPhoto, except with a much more streamlined interface. In my experience, Focus produced really nice results, especially given its price and overall simplicity. There are other tools that give users a greater level of control, but they’re also more complex and require more fine tuning to get the desired effect. The presets that come with Focus provide a great starting point, so customizing adjustments should only take a few moments. The only complaint I have about Focus is its lack of file format support when exporting. Currently the only export option is JPG, so adding PNG and TIFF would be a great feature enhancement. With that said, Focus is only on version 1.0.1 and the developer plans to release updates in the future. Considering how solid the app is already, I’m looking forward to seeing what they add next. Win a free copy of Focus for Mac! The developers of Focus (regularly $4.99 on the Mac App Store) have been nice enough to offer a free software license to one lucky MacYourself reader! To enter, please leave a comment below, along with a valid email address (this is how we will contact you). In order to avoid spam filter issues, please type a coherent sentence saying you’d like a chance to win. Make sure you have access to the Mac App Store since this is the only way to get Focus. Multiple entries will be deleted, so please only add one comment per person. And finally, don’t worry if your comment doesn’t appear on the site immediately — it might be awaiting moderation and will show up shortly. The winner will be chosen at random based on the comment number they happen to be. The lucky guy or girl will be announced on this page, so save this article’s URL and be sure to check back later. All entries must be made by September 23, 2011 at 11:59pm eastern U.S. time. In the meantime, check out Focus on the Mac App Store to learn more about what it can do. Good luck! Congratulations to our winner, Gail! Her comment number was chosen from a random number generator and she has been given a free copy of Focus for Mac! Thanks to everyone who entered and remember to consider purchasing a copy of Focus on the Mac App Store yourself. I would like the chance to win a copy of Focus. I would like to enter the contest for a chance to win Focus for Mac. This sounds like a great app. I’d love to win it. I would like to enter the contest! It seems really useful to create tilt shift… I’m in the contest! I’d love to have a copy of Focus! Please enter me in the contest to win Focus for Mac. I like to win stuff, because then it’s….free! I’d love to win this too. I would love to add Focus to my Mac app collection! Focus on me please, I’d be stoked to win this amazing app! !